A trip to London isn’t complete without visiting the Emirates and watching an Arsenal match. The capital’s newest Premier League stadium is also the most luxurious. And with 60,000 regularly filling the stadium, the place to go to watch the best football in the land. We’ve got Arsenal tickets available in most areas of the stadium so there’s no need for you ever to miss out on an Arsenal match. With such a great selection it means that we can offer ticket prices to suit all budgets. Whether you want to cheer on the Gunners at home or away we can supply you with the Arsenal FC tickets for your chosen match at truly terrific prices. Mesut Ozil, Alexis Sanchez and Granit Xhaka just some of the stars whose slick passing moves give rise to passionate support among Gooners. With unrivalled views from anywhere in the stadium, this is your chance to share your passion for one of England’s most revered clubs. A night at the Emirates, when the place is rocking, is unrivalled in the Premier League. And once the match is over, the ground is no more than a fifteen-minute tube ride from the heart of one of the world’s truly great capital cities. All of London’s fantastic nightlife is on your doorstep with easy access to the tourist attractions during the daytime. For more info about seating categories, special arrangments and other useful info - read help text on the bottom of this page. The Emirates Stadium, located just a stone’s throw away from Arsenal’s spiritual home, Highbury, is a thoroughly modern football ground. Uninterrupted views of the pitch wherever you are sitting. Despite a capacity of a little over 60,000 – the total varies depending on the competition, there’s no sense that you need a pair of binoculars while even the most basic seats are some of the most comfortable you will find in any football stadium in the world. Home to one of the world’s best-supported clubs, it’s no wonder that tickets for Arsenal games can be hard to come by. There is, however, a thriving secondary ticket market with season-ticket holders ready to sell-on their tickets for most matches. There are several things to bear in mind when you are buying Arsenal tickets. 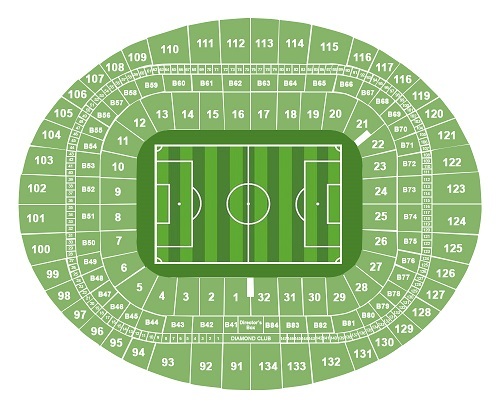 Seating Category – there are differences in prices between the various seating location you chose and it’s all about your personal preferences - some fans wouldn’t go for less than the Club level/Hospitality tickets and some would want specifically to be seated in the Long side central lower tier to see everything from up close and other would feel great viewing the entire ground from the Long side upper tiers. Arsenal operate 3 ticket categories: A, B, and C.
Cat A games are the big matches and Arsenal ticket prices regularly attract criticism here. The fixtures here are typically the biggest games of the season: Manchester United, Tottenham, Liverpool, Chelsea, Manchester City and the top seed in Arsenal’s Champions’ League group. In the secondary ticket market, the prices for these matches are typically £150 and more. The prices will also be a lot higher when Arsenal are in the title race as they are scarcer. Some FA Cup ties may be Cat A but the club tries as much as possible to make them Cat B. This category features the FA Cup, Champions League and mid-table Premier League teams. Secondary market prices tend to carry less of a premium and can start at as little as £60. Arsenal rebalanced the number of matches in Cat A and introduced Cat C a couple of years ago, after pressure from supporter groups. It works well and Cat C games tend to be struggling Premier League sides. These are the matches most frequently seen in the secondary market and are cheap. Arsenal tickets for these games can be seen for as little as 10% over face value. The best value Arsenal football tickets are for the EFL Cup. Arsene Wenger has used a mix of first team stars and youth players, so the club reduced the ticket prices for every round up to the final. They really are cheap Arsenal tickets! There are four stands, replicating the naming convention at Highbury. There two shortsides (the North Bank whilst opposite is the Clock End). Visiting supporters are housed in the lower tier here, in the corner leading into the first longside (the East Stand), which runs parallel to the pitch. Finally, you have the second longside (the West Stand) which houses some of the best seats in the Emirates. This is where the teams emerge from the tunnel and the two benches are sited. Both are open air so you are close to the managers and their staff, hearing their instructions as clear as day. Getting into the front rows around the technical areas is a fantastic way to get involved in the action and really on top of the action on the pitch. Always wanted to be a star of the silver screen? These are the seats to have, with cameras panning round for television coverage and on the screens in the corners of the stadium! Your family and friends will see the fun you’re having, and be jealous. Next time, you can bring them as well! Each of the stands has great access routes to the public transport in the area and it is all well signposted on the outside concourse. However, Arsenal tube station can be busy at the final whistle so consider using Highbury and Islington or Finsbury Park instead. A slightly longer walk but you will probably get back into central London quicker. The North Bank is best served by Arsenal tube station, as is the East Stand. The Clock End favours those travelling to / from Highbury and Islington whilst the West Stand favours Finsbury Park after the game. Holloway Road tube station is always closed after matches. It’s worth remembering that these are only suggestions and not hard and fast rules. All of the tube / rail stations can be easily reached from anywhere in the ground. In front of the boxes is the Club Level. These were aimed at the wealthy and corporate supporters but are frequently available to buy. The seats are probably the best view in the house but be aware that the half-time rush to the bar is chaos. At least whatever drink you want is free! That’s right, these are the hospitality suites and you get the service you expect as part of your package. There are also restaurants for your exclusive use before and after the game, although you must pay for these as you use them. You don’t have to worry about rushing back to your seats; there’s no hurry among the majority of club level supporters with the tier filling about five minutes after the teams come out for the second half. You get a great view of the pitch wherever you are sitting in the upper tiers. You get a great mix of supporters in these parts of the ground, ranging from families to football tourists, season ticket holders to day-trippers. The experience is superb; the whole of the pitch is unobstructed and despite being high up, there’s no sense that you are miles away from the action. In the corners of each end, you get a great perspective of the game from an unusual angle; there aren’t many unobstructed views. The best view is the longside (East Stand) opposite the extended tunnel the players emerge from. You’re the first one to see them ready to enter the arena; your adrenalin gets pumping before anyone else in the ground. There’s nothing like that pre-match rush! If the upper tiers are a mixture of supporters, the lower tiers in the shortsides (Clock End and North Bank) are the vibrant areas of the Emirates. These are the heart and soul of the stadium, with the fans who sit here the lifeblood of the club. The vocal supporters congregate behind the each of the goals and there’s a superb collective of Arsenal fans online – Red Action – who regularly meet with the club to work on ways on ramping up the atmosphere at home games. Whichever game you go to, the dearest outside of the club level tickets is likely to be the lower tier. They are the most popular seats and the ones which get you as close to football’s terrace culture as you can get. And when the action is at your end of the ground, the cameras will zoom in on you. Remember to have your game face on! Despite being all-seater, both the shortsides (North Bank and Clock End) are up and down on their feet constantly during a match. As the Arsenal pour forward, it’s a regular sight to see the lower tier rise en masse with a sense of expectation and sharp intake of anticipation at the net bulging. The longsides (East and West stands) are more sedate by comparison. The slope on the seats offers the perfect view of the game and you are so close to the action that you can see the beads of sweat pouring from the players’ heads. That’s something the man in the Upper Tier won’t get to see. And while you can see the whole of the pitch with an unobstructed view, those behind the goal have the net to look around, as well as no idea whether the ball has gone out of play at the other end. In the shortside (Clock End) is a section specifically set aside for youths and it is situated near the Family section to give a sense of independence to older children. You can keep an eye on them. Disabled supporters have a section at the front of the shortside (the Clock End) upper tier with wheelchair access in a paddock and seating behind. How to Buy Arsenal Tickets Online? Thinking where to buy Arsenal tickets? getting tickets on the primary market is possible but if you’re not a club member or you’ve missed the public sale for non-member (which often is sold-out in a matter of minutes or hours tops). Your best chances are in the secondary market. You have a variety of available categories. Pairs of tickets are also available (WoW guarantee them for all categories expect Single – needless to say), for more than a pair or groups – contact us – we have it available on several categories but not on all categories and not at all times. However, you should be able to find seats in the same block, reasonably close together. For Cat A, you are struggling but also for games such as West Ham United, where there is a fierce local rivalry. And you never know your luck; Arsenal supporters can be accommodating and willing to swap seats with you – it’s a case of being lucky on the day. The most popular matches are Saturday 3pm kick-offs but all games on Saturday’s are popular. Sunday 4pm – typically live on TV – can cause some problems with transport so there is a brisk activity in the secondary market for these matches. Depends on the opposition. Midweek matches see a lot of tickets available but you need to be quick for the Champions League! These are popular matches no matter the opposition and there’s a buzz about the place which is unique to them. Select your Arsenal fixture from our events table above or our match menu. You can buy for Arsenal home games or away tickets. In the review your order page you will be able to review Arsenal tickets that you have ordered and the total price you will be paying in the next stage if you have been given a coupon or discount code, enter this in the box and click “apply”. The final Arsenal ticket prices will be calculated and then click “Proceed to payment”. There are no hidden fees or costs and the total price you see is what you will pay for Arsenal football tickets. After payment is successfully processed you will be redirected back to our site and you will receive a confirmation message. An email with your Arsenal ticket order details will be sent to the email address you have provided during your registration. Tube station: Arsenal (Piccadilly Line) is the closest to the Emirates Stadium. Thanks to their long and esteemed history, it will come as little surprise to learn that Arsenal FC has racked up many statistical feats. Established in 1886 they joined the football league in 1893 and were soon a force to be reckoned with. They won two FA Cups and five League Championships during the 1930’s before their incredible run was halted by WWII. After winning the league title in 1953, the club had to wait until 1971 before they were crowned champions again. In 1989 a 2 – 0 win at Anfield with Michael Thomas’ goal in the last minute gave them the title on goals scored from Liverpool. In 1992/93, Sheffield Wednesday were sick of the sight of Arsenal as the Gunners beat them in both the FA Cup and League Cup finals, to become the first English club to complete the domestic cup double. They also hold the record for the longest winning streak of 14 matches in the top flight and the longest unbeaten run totaling an incredible 49 matches. Under the watchful eyes of manager and master tactician George Graham and more recently Arsène Wenger they have enjoyed incredible success with seven FA Cups, five League titles, a Champions League final and two league and FA Cup Doubles, as well as becoming the first English club to win both the FA Cup and League Cup in the same season. 2016/17 threatened to be a season to forget but beating Chelsea in the FA Cup final means it was a season to remember. The Premier League was hugely disappointing as the Gunners fell into the Europa League places. But every cloud has a silver lining; Arsenal are among the favourites the win a European trophy next season! Thierry Henry, 228 goals in 337 appearances. Thierry Henry’s achievements at Arsenal were cast in bronze outside the Emirates to commemorate his achievement as the club’s leading goalscorer. He was quite simply the greatest goalscorer ever seen in the Premier League. Henry had two spells at the club. His first ended in 2007 when after scoring 226 goals in 369 appearances, he left for Barcelona. But he returned to Arsenal in 2012 for a short spell and created one of football’s iconic moments in scoring on his return to the Emirates against Leeds United. 26th May 1989. The closest run title race in the history of English football. Liverpool, in their prime and top of the table, had clawed back Arsenal’s lead and were set to win the double, having already beaten Everton in the FA Cup final. Arsenal, second and three points behind Liverpool, travelled to Anfield for the final game of the season and had to win by at least two goals to become champions. A tense affair in the first, the Gunners made the breakthrough on 51 minutes when Alan Smith glanced in a free kick. Michael Thomas had a chance for the second goal with twenty minutes to go but shot straight at Bruce Grobbelaar. With time running out, John Lukic threw the ball to Lee Dixon. His pass reached Alan Smith who flicked the ball inside to Michael Thomas. A second later he was in the penalty area and flicked the ball into the Liverpool net to win the title. Brian Moore’s commentary is one of the most famous moments – “It’s up for grabs now!” – as Thomas ran through to score.